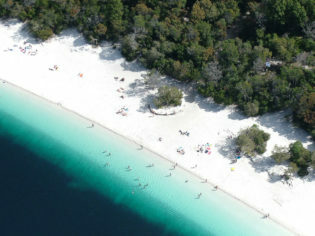 The colour contrast of Fraser Island’s aquamarine water and sugar-white sand is astounding (photo: Snapair). Quentin Long takes his extended family to Fraser Island and everything is not as expected. There is something undoubtedly special about Fraser Island. Not a simple special but ‘touch-your-soul life-affirming’ special. The philosopher du jour, Alain de Botton explores this particular type of ‘special’ in his book The Art of Travel. The Swiss-born scribbler takes himself off to the Sinai desert to ‘feel small’. He is so touched by the landscape as it “provoked an identiﬁable feeling that was both pleasurable and morally good”. He defines this feeling as the sublime. Yep. That’s Fraser Island: pleasurable and morally good. Perfect, then, not just for a family holiday, but an intergenerational family holiday. 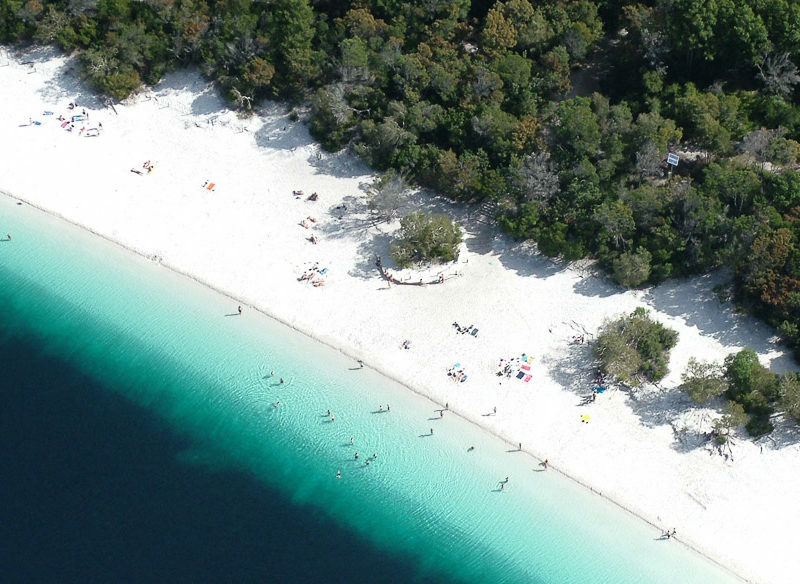 Fraser Island’s lush interior is just as impressive as its aquatic playground. The island’s mystical powers of wellbeing and providence are somehow entwined with the remarkable yet unexpected nature of its flora. The fact that it’s the largest sand island in the world with a 90-kilometre stretch of beach known as the ‘highway’ on its eastern edge is well documented, as is its credentials as one of Australia’s best spots for whale-watching. But the spectacular wooded glades, iridescent and verdant rainforests, and open scrubby plains of scribbly gums are a pleasing surprise. At Central Station, the former logging camp at the heart of the island, thick monolithic gnarled hoop pines host staghorns in almost every branch. Access to the rainforest is by a peaceful walk along the Wanggoolba Creek, a simple trail that snakes under the towering foliage and through the thriving undergrowth of perfectly formed and symmetrical ferns and palms. Pure unblemished water gently floats across brilliant white sand. A soundtrack of birds flittering above harmonises with the tinkle of the spring-fed stream. On the other side of the creek, the trail journeys up from the rainforest to a towering woodland of perhaps the most wonderful and impressive of the island’s trees: Fraser Island turpentine. Their trunks are singularly straight and flawless. The largest would measure at least six metres in circumference. My sons and I try to link arms around one of them and can’t complete the circle. They are awe-struck when I suggest this specimen would be at least 1000 years old. A mainstay of the logging industry on Fraser Island, their sap was found to be resistant to marine borers. Thousands were shipped to Egypt for the construction of the Suez Canal; perhaps Australia’s most unrecognised natural gift to modern development. The species owes its survival to the Fraser Island Defenders Organisation (FIDO), which successfully campaigned from 1971 to 1991 to stop logging and sand mining on Fraser Island. While the interior greenery of Fraser Island is somewhat of a surprise, the sea lives up to expectations. Whales slap their tails on the water as we drive the sandy coastal highway. My six-year-old and I take a scenic flight; he is rapt at spotting more than eight whales below. The legendary freshwater lakes similarly over-deliver. At Lake Mckenzie, the shore is flawless, the aquamarine water sparkling as it laps the incredibly fine white sand (which does indeed scrub jewellery clean). When not exploring the island, we make the most of the accommodating surrounds of Kingfisher Bay Resort. The boys swim at the pool under the watchful eye of their grandmother while mum and dad have an afternoon snooze. The intergenerational camaraderie is joyous as they giggle incessantly poolside. Families love playing about on Lake Mckenzie’s shore. The birthday dinner organised by the resort for my son sets us up for a life time of failure. In the bush, a huge table lit by flame torches is set; fine-dining in a primitive location. The food is some of the best bush tucker I have ever eaten. But it is far simpler times that become most emblematic of Fraser to me. “I caught one!” I spin around and see my five-year-old triumphantly holding a small fish aloft. I’m filled with joy for him and pride in his fearlessness, capping off a leisurely three-hour father-and-sons beach visit. After a conversation about the wisdom of keeping their catch as a pet – and a few tears upon learning that it won’t survive the flight home – they release it back to the sea. My heart is bursting with pride at their humanity. It may not be a life lesson they’ll remember, but I certainly will never forget it. Much like Fraser Island itself. Getting there: A daily barge takes cars and passengers to Fraser Island from River Heads, 20 minutes south of Hervey Bay. Staying there: Kingfisher Bay Resort has four types of accommodation; houses, villas, hotel rooms and quad-share wilderness lodges.